For two and a half centuries, Philadelphians have been actively involved in archaeological research. In particular, three vital and venerable cultural institutions—the American Philosophical Society (founded 1743), the Academy of Natural Sciences (founded 1812), and the University Museum of the University of Pennsylvania (founded 1893)—have nurtured the "systematic study of antiquities." The ten essays in this volume focus on Philadelphians who were concerned with Americanist archaeology, or the "archaeology of the New World." As Europeans, and later, Euroamericans, spread across North, Central, and South America in the 16th through the 19th centuries, they encountered a bewildering variety of native peoples, customs, and languages, as well as tens of thousands of ancient ruins attesting to a long endemic culture history of obvious complexity. The essays examine most of the key players in the development of the methods to study these phenomena. Enlightenment scholars such as Benjamin Smith Barton, Peter S. Duponceau, Thomas Jefferson, Daniel Garrison Brinton, John Wesley Powell, and Benjamin Rush all contributed to the surge of scientific study of America's prehistoric cultures. So did two pioneering women who have received scant attention to date—Sara Yorke Stevenson and Lucy W. Wilson—but whose work is well treated in this study. Other essays detail the varied contributions of C. C. Abbott, Frank Hamilton Cushing, Clarence B. Moore, Edgar Lee Hewett, and John L. Cotter. 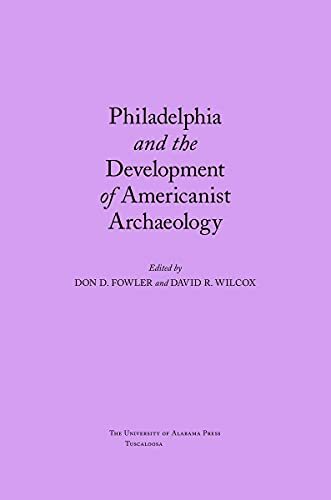 This volume should stimulate continued interest in the origins and history of archaeology and the relationship of Philadelphia patrons and institutions to scientific inquiry. Don D. Fowler is Professor of Anthropology at the University of Nevada, Reno, and author of American Archaeology: Past and Present. David R. Wilcox is Senior Curator of Anthropology at the Museum of Northern Arizona in Flagstaff and coeditor of The Last Itinerary of Frank Hamilton Cushing.